The best neighborhoods, communities and villages around Palm Springs and Palm Desert definitely changes from time to time but there are other neighborhoods that are tried and true and stick around being a landmark, and icon and a pillar in the community. 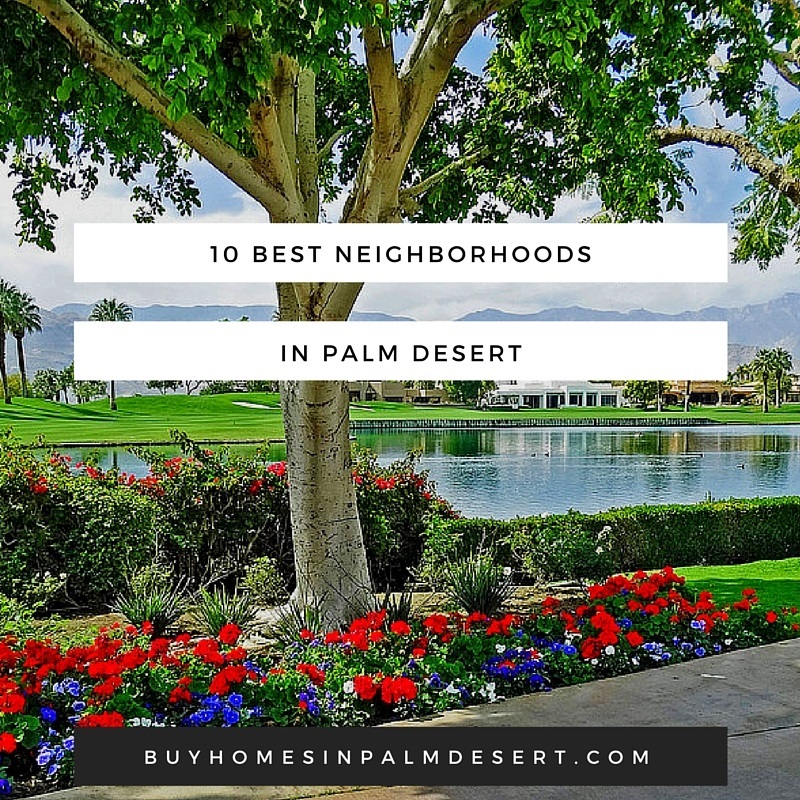 If you're considering moving to Palm Desert or maybe within Palm Desert or from an neighboring city or town there are certain communities and neighborhoods that have stood the test of time and come in as some of the best neighborhoods in the city. Here's a list of 10 neighborhoods around Palm Desert that are popular and desirable. Cahuilla Hills - This neighborhood offers a private setting without large price tags. This is a non-golf community with a large selection of homes on lots from .72 over 5 acres. It's ideal for anyone looking for a country living or maybe perhaps and equestrian property. Homes are between $350,000 to over $1.5 million. Hidden Palms – This area is ideally located in is a condominium community with a gated entrance, for swimming pools, tennis courts and even a lake. It's close to the El Paso shopping center and close to great restaurants and culture. It does have a homeowners association but the fees are low and homes sell between $200,000 and $380,000. Lantana - This neighborhood is perfect for anyone moving to the area because it's centrally located in close to all levels of schools. This selection of 64 homes is nestled on four cul-de-sacs and many homes have their own swimming pool. There are no community facilities but there is a homeowners association. Homes sell between $450,000 and $700,000. Bighorn Golf Club – This community is nestled in the southwest corner of the city at the foothills of the Santa Rosa mountains. This private neighborhood has luxury homes starting at over $1.5 million and even though it's not the most affordable place, the lifestyle and private setting are exclusive to this community. It's just five minutes to Palm Desert, shopping and restaurants and of course close to two championship 18 hole golf courses and provides a variety of community amenities such as a clubhouse, swimming pool, business center and dining facility. Chaparral Country Club – This country club is known as one of the best kept secrets in the Valley. It's located just north of Palm Desert within walking distance to the local elementary school. Condominiums start at about $180,000 and residents have easy access to the on-site executive golf course, tennis courts, clubhouse and 21 swimming pools. Ironwood – This is one of the most distinguished neighborhoods in Palm Desert featuring two private golf courses in a 24-hour guard gated entrance. Two and three bedroom condominiums start at around $250,000 where single-family homes start about $500,000. Indian Ridge – This private, member owned equity country club features world-class golf course, tennis club, fitness club and a variety of other on-site club amenities. It has its own homeowners association and features a mix of condominiums and single-family homes from 2000 ft.² to over 5500 ft.². Prices start around the mid-$400,000 range. South Palm Desert – beautifully manicured lawns, top rated schools and fantastic mountain views all add to the charm of South Palm Desert. Larger lots features spacious streets and sidewalks with no homeowners association fees. Homes range from about $200,000-$750,000. Valencia – This newer community is a small, gated neighborhood of just under 100 homes. There are luxury homes and quaint homes ranging from 2400 ft.² to over 3500 ft.². Most recently homes have sold between $480,000 and $620,000. If you would like information on any of these neighborhoods were complete list of homes for sale that are active and currently available contact my office today. I'd be happy to offer tips, suggestions and more all about Palm Desert real estate and some of the best neighborhoods in the area.